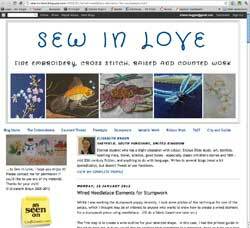 Wired Needlelace elements for Stumpwork is a tutorial written by Elizabeth Braun. This is a very useful, well illustrated general tutorial. Using needlelace techniques Elizabeth demonstrates how to create stumpwork elements such as flower petals, leaves and insect wings etc. The focus is on how to work the shape required rather than needlelace stitches.